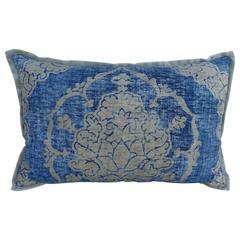 Pink and blue romance through the Gilded Age’s Asian textiles patchwork bolster pillow Decorative pillows handcrafted from two Asian antique textiles combining floral silk cut velvet gaufrage in pink with chrysanthemums motifs and blue clouds. 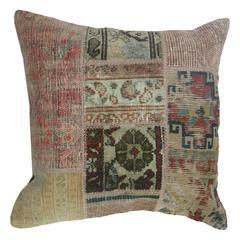 Late 19th century Asian textiles squares were stitched together to render a patchwork technique to modernize the designs and offer a geometrical look to the front panel of the throw pillow. These very soft velvets provide a very tactile experience to the luxury decorative pillow further embellished with a frame of A.T.G. custom orange flat silk trim all around. Backing with a burnt orange satin silk. Decorative pillow designed and handmade in the USA. Closure by stitch (no zipper) with a custom made pillow insert. Size: 15 x 20 x 6.